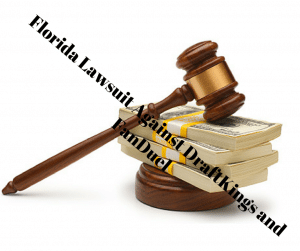 According to recent news, two Florida-based daily fantasy sports players are filing a lawsuit against the two largest DFS platforms currently in operation. Both DraftKings and FanDuel will be sending lawyers as representatives to address the controversial gambling case. The lawsuit was originally authored by Ervin Gonzalez, who is a well-known Florida attorney, and will be representing the two plaintiffs in the case. The legal complaint is 132 pages long and describes how both Antonio Gomez and John Gerecs are seeking damages from money lost in what the prosecution call “deceptive and illegal gambling.” The lawsuit aims at not only DraftKings and FanDuel but there several business partners as well. Among the defendants include investors, financial operators, media contracts, and more. Mr. Gonzalez, along with the two Florida plaintiffs, is asserting through their case that daily fantasy sports should be considered “racketeering” by both state and federal law. The lawsuit questions the legality of daily fantasy sports in not only the state of Florida but among the rest of the states within the Union. As of now, the daily fantasy sports businesses are running legally as a game of skill. However, the amount of rising legal claims will undoubtedly call for a reassessment through both state and federal gaming commissions. The case outlines that the co-defendants displayed negligence, while DraftKings and FanDuel operated illicitly, “while taking a slice too,” noted Gonzalez. The prosecuting attorney explained that his clients were not only “deceived and lured” into playing daily fantasy sports, but they were always competing against players that held “insider information.” As for daily fantasy secrets, the lawyer could be referring to a recent investigation covering a DFS platform employee cashing in on insider information. However, employees who work with impacting information, such as ownership percentages, are no longer allowed to place wagers in light of the investigation. Notably, the legal case does not target the National Football League (NFL), focusing on the National Basketball Association and Major League Baseball. Gonzalez spoke on how he feels the NBA has truly displayed hypocrisy through its recent partnership with FanDuel. the NBA recently held itself out as an entity that staunchly rejects betting on its games when former NBA official Tim Donaghy resigned from his job, but now has gone so far to legitimize FanDuel by having one of its employees, the NBA President of Global Operations, Mr. Sal LaRocca, serve on FanDuel’s Board of Directors and by becoming an official partner of FanDuel, launching the first “Official One-Day Fantasy Basketball game of the NBA. The Florida attorney goes on to attack the MLB as well, exposing contrarian statements made by the MLB Commissioner and sports ethics followed in the past. With such claims, the lawsuit reads as if daily fantasy sports are and should be treated the same as traditional sports betting. However, due to federal law, the game is still considered legal. FanDuel, DraftKings, and their business partners will fall back on the defense that their operations are and have been always within the law’s boundaries. Although, a good handful of states have changed their state gambling statutes outlawing the online gambling option. Among those who have chosen against daily fantasy sports is the state of New York. Currently, the state’s Attorney General, Eric Schneiderman, is in an ongoing debate with FanDuel and DraftKings’ attorneys on whether the game is primarily chance or skill. The two parties met today to begin an ongoing case that is “just getting started,” according to lawyers. Even with a significant amount of skill, the finding of a large deal of chance would be enough to amend state law and push daily fantasy sports out of the Empire State. As of now, several cases are still currently open, involving DraftKings and FanDuel as the defendants. However, none of them have proved that the sites are operating illegally as a game of chance. The states that do consider DFS betting as illegal gambling do so using the “any chance” test, which outlaws any game that is uncontrollable and relies even slightly on chance. In 2006, fantasy sports betting was exempted from the Unlawful Internet Gambling Enforcement Act that resulted in US Congress shutting down nearly every form of online gambling. Daily fantasy sports, along with other skill games, remain the only legal and legitimate ways to wager real cash online. The reasons that Congress allowed the game to operate in the US was due to skill components that dramatically impact the game. Although 70 percent of DFS contestants end on the losing side of the table, the 30 percent who do win reach success through research and effort. Previous story Are DraftKings and FanDuel Advertisements Misleading?